Where FutureYear fits in – Your future! You have Facebook for catching up with past friends made and viewing past photos etc. Twitter is all about the present, what is happening right now around the world. 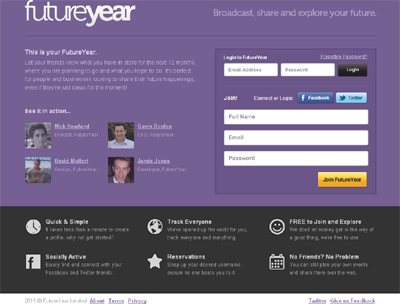 FutureYear looks beyond your past and present and asks what are you and your friends doing in the future. FutureYear is all about your next 12 months. Broadcast what you have planned, where you’ll be around the world, and what your ambitions are for the next year. Share with friends, even if they’re just ideas at the moment! Explore the future with FutureYear! Search for events by date, topic or location to find stuff to do. Bored next weekend? Find out what is on in your area or what your friends will be up too!